John Clement Madden was the son of Dennis and Ellie F. Hishon of Lot 34 Concession 11, East Nissouri Township. While living in Detroit, USA, Clem was employed as an inspector. 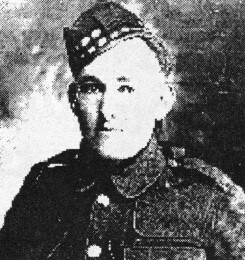 In 1916, he enlisted at Windsor, Ontario in the 241st Canadian Infantry Battalion (Scottish Borderers). On April 29,1917, he sailed to Englalnd on the SS Olympic. The 241st was disbanded on arrival and he was posted to the 5th Reserve Battalion at Lower Dibgate where he was held as a reinforcement for an Ontario battalion in France. There was some concern about his eyesight but after careful assessment he was passed as "fit". On September 23 he was posted to the 15th Canadian Infantry Battalion then serving in the Lens area with the 3rd Infantry Brigade in the 1st Canadian Division. In November 1917, the 15th Battalion was committed to the Battle of Passchendaele where they served as support but not as an assault battalion. On November 7, 1917 he was promoted to Acting Lance-Corporal until a replacement was transferred to his unit until January 11, 1918 either because he transgressed some military rules or because of the common belief that non-commissioned officers had a significantly higher casualty rate than private soldiers. He did routine front line tours in the Vimy sector, during the winter of 1917 -1918. On August 26, they were part of the assault force at the battle of Arras. The attack was successful and over the next few days, the Canadians were able to drive the Germans back to the Canal du Nord. On September 1, 1918 they attacked German positions at the Crow’s Nest (a hill) and Chateau Wood north east of Hendecourt-les-Cagnicourt. During these operations, Madden was wounded in the neck by enemy machine gun fire. Company stretcher bearers administered first aid shortly afterward but Private Madden died before he could be evacuated. Predeceased by his father, he is buried in the Dominion Cemetery at Hendecourt-les-Cagnicourt in France. He was survived by his mother, and two brothers, Frank who was living with his mother and Joseph who was also serving in France. His sister, Mrs. Marion Clyne lived in East Nissouri. -- Courtesy of St. Marys Journal Argus.